Why my rant against the Democratic candidate’s prescription for America went viral. 2016 seems like a strange time to be arguing the merits of socialism in an American presidential campaign. But it’s also strange for the prospective leaders of the free world to be talking about the KKK and their appendages, so clearly this year is not like any other. While the latter topics are, thankfully, beyond my purview, I have a great deal of interest in socialism. My goal was to remind people that Americans talking about socialism in the 21st century was a luxury paid for by the successes of capitalism in the 20th. And that while inequality is a huge problem, the best way to increase everyone’s share of pie is to make the pie bigger, not to dismantle the bakery. Much to my surprise, my little rant went viral, as the saying goes. Instead of the usual few hundred Facebook shares, this paragraph quickly reached tens of thousands. By the next morning it had reached several million people, more than any of the day’s political posts by the leading candidates. A week later and it has over 3,000 comments, 57,000 shares, and a 9.3 million reach that is in the category usually reserved for photos of pop stars and kitten videos. In recent decades that storyline has flipped. The tireless work ethic and spirit of risk-taking and sacrifice have slowly eroded. This complacency was accelerated by the end of the Cold War and it has proved very difficult to overcome in the absence of an existential enemy to compete with. The booming innovation engine of job creation has fallen behind the accelerating pace of technology that replaces workers. The result has been slower growth, stagnant wages, and the steady shift of wealth from labor to capital. In such situations many people turn to the government for help and the siren song of socialism grows louder. I respect and even like Bernie Sanders. He’s a charismatic speaker and a passionate believer in his cause. He believes deeply in what he is saying, which is more than what can be said about nearly every other 2016 candidate, or about politicians in general. I say this while disagreeing vehemently with nearly everything he says about policy. The “revolution” rhetoric of Senator Sanders has struck a chord with many Americans, especially the young voters who are realizing that their own lives are unlikely to match the opportunities and wealth of their parents and grandparents. They are being left behind in a rapidly changing world. It is a helpless, hopeless feeling. The problem is with the proposed solutions. A society that relies too heavily on redistributing wealth eventually runs out of wealth to redistribute. The historical record is clear. It’s capitalism that brought billions of people out of poverty in the 20th century. It’s socialism that enslaved them and impoverished them. Of course Senator Sanders does not want to turn America into a totalitarian state like the one I grew up in. But it’s a valuable example of the inevitable failure of a state-run economy and distribution system. (Check in on Venezuela for a more recent example.) Once you give power to the government it is nearly impossible to get it back, and it will be used in ways you cannot expect. The USSR collapsed because it couldn’t compete over time, despite its massive resources and devout ideology. The Soviets put a man in space before America but couldn’t keep up the pace against an innovating, free-market competitor. My Facebook post went around the world on technology created in America. The networks, the satellites, the software, nearly every ingredient in every mobile device and desktop computer, was invented in the USA. It is not a coincidence that the most capitalist country in the world created all these things. Innovation requires freedom of thought, freedom of capital, and people who believe in changing the world. A popular rebuttal is to invoke the socialist leanings of several European countries with high living standards, especially in Scandinavia. Why can’t America be more like happy Denmark, with its high taxes and giant public sector, or at least more like France? Even the more pro-free-market United Kingdom has national health care, after all. First off, comparing relatively small, homogeneous populations to the churning, ocean-spanning American giant is rarely useful. And even the most socialist of the European countries only became wealthy enough to embrace redistribution after free-market success made them rich. Still, why cannot America follow this path if that is what the people want? What is the problem if American voters are willing to accept higher taxes in exchange for greater security in the embrace of the government? The answer takes us back to all those inventions America has produced decade after decade. As long as Europe had America taking risks, investing ambitiously, attracting the world’s dreamers and entrepreneurs, and yes, being unequal, it could benefit from the results without making the same sacrifices. Add to that the incalculable windfall of not having to spend on national defense thanks to America’s massive investment in a global security umbrella. America doesn’t have the same luxury of coasting on the ambition and sacrifice of another country. Who will be America’s America? What other nation could attract the brightest students, the biggest investors, the most ambitious entrepreneurs in the same way? Germany? Russia? Japan? China? India? Each may take over leadership in some areas if America continues to falter, but none is equipped to lead the world in innovation the way the United States has since Thomas Edison’s day. None possesses the combination of political and economic freedoms and the human and natural resources required. The government does have a role in addressing rising inequality. I turn not to Denmark or Venezuela or, god forbid, to the Soviet Union. Instead let us look to the last great battle between labor and capital in America, between public and private power. Just over 100 years ago, President Teddy Roosevelt spoke loudly and used his big stick against some of the world’s largest corporations when they were abusing their monopoly power. His successor, fellow Republican William Taft, continued the antitrust mission, at least initially. Both men dealt with critics from industry and Wall Street who called their use of government power against them “socialism” and both answered eloquently. In his 1908 State of the Union address, Roosevelt spoke about “the huge wealth that has been accumulated by a few individuals of recent years” being possible “only by the improper use of the modern corporation,” and that these corporations “lend themselves to fraud and oppression than any device yet evolved in the human brain.” He also warned against the accrual of unaccountable political power in the hands of “men who work in secret, whose very names are unknown to the common people.” You can easily imagine Teddy in the bully pulpit today calling for the breakup of the big banks and ending their cozy relationship with Washington. To give credit, Senator Sanders supports breaking up the giant banking institutions that dominate American finance and politics in a way that would evoke jealousy from John Pierpont Morgan himself. However, Sanders’s socialist policies would replace banks that are too big to fail with a government that is too big to succeed. Bravo! Beautiful words and an even more beautiful sentiment that is deserving of its own Facebook meme! Unfortunately, today’s progressive solution would instead be to raise Standard Oil’s taxes and those of its wealthiest shareholders in order to pay for more services, like free college and health care. It would have been an acceptable choice for many, but the American 20th century would never have happened. 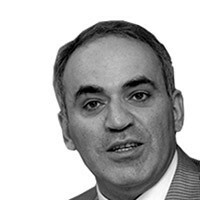 Garry Kasparov is the chairman of the New York-based Human Rights Foundation and the author of Winter is Coming: Why Vladimir Putin and the Enemies of the Free World Must Be Stopped.